A read-only wrapper for a source model. 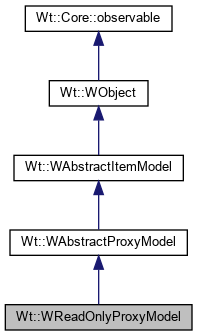 This is a simple proxy model which provides a read-only view on a source model. This is convenient for situations where you want to share a common read-only source model between different sessions. This returns the column count of the source model. Returns the index in the source model. Always returns false and has no effect. Returns the parent of the given index in the source model. This returns the row count of the source model.